The 2010 Tri-History Conference was held June 21‐23, 2010 in Raliegh, North Carolina. The cover icon of Manteo and Virginia Dare commemorates two milestone Church of England baptisms in 1587. 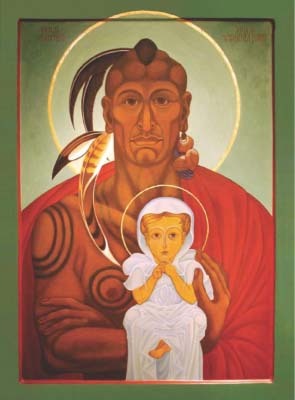 On August 13, Manteo, a Native American of the Algonquian nation, was baptized. His baptism was the first recorded on American shores and the first recorded of a Native American in the Church. On August 18, Virginia Dare, the infant grandchild of Governor White, became the first child born to English settlers. Her baptism two days later was the second recorded in North America. Introduction to Archives - Susan G. Rehkopf, Archivist and Registrar, Diocese of Missouri - This is a workshop for both novice and experienced archivists alike. Whether your congregation already has an archival system – or you don’t know where to begin – this workshop will provide you with information to improve on the system you currently have in place, or will help you get started and get you energized to take the next steps. Preservation and Conservation Concerns for Archival Collections - Sarah E. Koonts , Head, Collections Management, North Carolina State Archives - This workshop seeks to provide basic guidance for those who find themselves with archival responsibilities. The focus is upon proper storage and conservation practices, complete with “Show and Tell,” led by the state’s chief preservationist. Workshop on Oral History: Some What For’s and How To’s - Susan Johnson, President, Episcopal Women’s History Project; The Rev. Dr. Matilda E.G. Dunn, Vicar, St. Mark's church, Copperhill, TN - Discover some essential questions to ask about your project before you begin to ask questions of your subject. Explore the ins and outs of background research, equipment, audio/video formats, transcripts, agreements, and distribution of your final product. Annual Dinner of the Historical Society of the Episcopal Church - “Globalization and Catholicity: The Historiography of a Recent Tri-lateral Dialogue”, Presentation by the Rev. Canon J. Robert Wright, D.Phil., St. Mark’s Church in the Bowery, Professor of Ecclesiastical History and Historiographer of the Episcopal Church. “Pauli Murray Heritage Bus Tour” to Chapel of the Cross in Chapel Hill and St. Matthew’s Church in Hillsborough, including sites associated with Pauli Murray -Tour Leader: The Rev. Dr. Brooks Graebner, Rector, St. Matthew’s Church, Hillsborough, and Historiographer, Diocese of North Carolina, This guided bus tour will include Pauli Murray’s childhood home, school, and church (St. Titus) in Durham, along with a viewing of some of the Pauli Murray public murals in Durham. The tour continues at the 1848 Chapel of the Cross in Chapel Hill, where Pauli Murray’s grandmother, Cornelia Fitzgerald, worshipped as an enslaved child and where Pauli Murray first celebrated the Eucharist in 1977. The tour concludes with a reception at St. Matthew’s, Hillsborough, where Pauli’s great-great grandfather was a member of the vestry in the 1820s, and where her aunt Pauline was baptized in 1872. Good Shepherd” Tour of State Archives - “Doing Research in the North Carolina State Archives”, Debbi Blake, Supervisor, Public Services Branch, Archives of the State of NC. Tour of Historic Christ Church - “Christ Church - Richard Upjohn's English Country Church” Established in 1821, Christ Church is the oldest Episcopal congregation in the Raleigh area, and one of the three largest parishes in the Diocese. Completed in 1851 at a cost of $30,000, it was meticulously restored in 2000-2001 at a cost of $3.1 million. “That They All May Be One?’: Ecumenism, Missions, and Partnership, 1910-2010” - The Rev. Dr. Heather A. Warren, Assoc. Prof., University of Virginia - This paper looks at shifts in ecclesiology that arose as the international ecumenical movement gained momentum through the first two-thirds of the twentieth century. From the World Missionary Conference of 1910 through the Toronto Anglican Congress of 1963, church leaders’ ideas about the nature of missions and the nature of the church influenced each other, leading to the articulation of new arrangements for the ways that the churches understood themselves in relation to each other. The post-colonial decades have stirred their own share of ecclesiological exploration, resulting most recently in the tragic irony of debate over “inclusiveness” in Episcopalian ecclesiology, whether directly or indirectly, becoming a flashpoint for disunity. “Beaded Prayerbooks: Episcopal Partnerships with Native Peoples” - The Rt. Rev. Carol J. Gallagher, Ph.D., Rector, All Saints' Church, Harrison, NY - This paper will look at the many ways the Church has partnered with Native people over the past four centuries. It will also help us understand what the real impact of those partnerships has been on our Church and the Anglican Communion. “Common Mission in a Communion in Crisis? Lessons from the Struggle over Sexuality” - Miranda K. Hassett, Ph.D., Asst. to the Rector, St. Andrew's Church, Hopkinton, N.H. - Globalization is a phenomenon created by individuals and organizations actively forging worldwide connections. The development of a sense of global Anglican identity in the late 1990s and early 2000s was closely tied to the Anglican struggle over attitudes towards homosexuality during the same period. New North/South inter-Anglican alliances developed to oppose church tolerance of homosexuality, strengthened by highly-motivated Northern partners and by norms of reciprocity that made Southern partners’ participation meaningful. The success of these global alliances carries lessons for anyone seeking to build trans-local relationships for common mission. Serving Christ in the Land of His Birth: Anglicans and Refugee Relief in the Middle East, 1895-1950” - Gardiner H. Shattuck Jr., Ph.D. , Priest-in-Charge, Church of the Good Shepherd, Pawtucket, R.I. - This paper examines the involvement of Anglicans in refugee relief in the Middle East from the beginning of the Armenian genocide prior to World War I through the creation of the state of Israel following World War II. It places Anglicans’ longstanding concern for the plight of refugees in the Holy Land and other parts of the Middle East within the context of evangelistic efforts by the Church of England and the Episcopal Church throughout that region. “Good Intentions: The Diocese of Alabama and Female Education ca. 1845-1920” - Barbara Brandon Schnorrenberg, Ph.D. - Several attempts to establish an Episcopal school for girls in Alabama were made in the diocese's first 75 years. All failed, in contrast to the schools established by other denominations in Alabama and Episcopal schools elsewhere. The history of these schools tells something about Alabama Episcopalians and their attitudes. The conclusions will suggest reasons why the schools failed. “Educating the Former Slaves: Isabella James and the Freedmen’s Commission, 1866-1870” - Mary Sudman Donovan, Ph.D., former President, Historical Society of the Episcopal Church - At the end of the Civil War, the Episcopal Church formed the Freedmen’s Commission to address the plight of newly freed blacks. Under its direction, a troop of northern women moved into the South to establish schools and religious programs. This paper examines the clash between the political and religious bureaucracies established to “aid the freedman” and the idealistic reformers recruited to administer the “aid” and suggests some future implications of that struggle. “A Distinctive Contribution: The Bishop Tuttle Memorial Training School, 1925-1941” - Lynn Hoke, MA, Project Archivist; ECW Archivist/Historian, Diocese of North Carolina - “Where can a young Colored woman get training for Church work?” You, too, might have asked this question in the early 1920s. Through its funding and organizational leadership the Woman’s Auxiliary answered by building the Bishop Tuttle Memorial Training School in Raleigh. This school’s rise and demise form a long overlooked chapter in Episcopal Church and American social history. “Video Presentation: Change Comes Knocking” - Introduction: The Rev. Dr. Brooks Graebner, Rector, St. Matthew's Church, Hillsborough, NC and Historiographer, Diocese of North Carolina - In the mid-1960s, North Carolina was home to the NC Fund, an ambitious statewide, bi-racial organization that sought to confront directly issues of race and class in an effort to address systemic and entrenched poverty. Headed by a lay Episcopalian, George Esser, the NC Fund brought into prominence community organizer Howard Fuller, whose controversial project, the Malcolm Liberation University, Durham, NC, initially received financial support from the 1967 General Convention Special Program. The film Change Comes Knocking documents the work of the NC Fund – its lasting achievements and its unfinished agenda. Commentators will highlight the engagement of the Episcopal Church in this work. Gardiner H. Shattuck, Jr., Ph.D., Priest-in-Charge, Church of the Good Shepherd, Pawtucket, R.I. The Rev. Lisa Fischbeck, founding Vicar of the Church of the Advocate, Carrboro, N.C.
“No Step Backward: Alexander Crummell’s Vision of ‘God’s Gracious Designs for Africa” - Carl R. Stockton, D.Phil., Professor of History and Academic Dean emeritus, University of Indianapolis - This paper will explore the origins and development of Crummell's theology of mission; his motivation to be a missionary in Africa; his missionary activities in Liberia; and finally his disillusionment with missionary enterprise in general and Liberia in particular. The paper will attempt to evaluate Crummell's contribution to foreign mission efforts, especially of the 19th century Episcopal Church, in a period of domestic turbulence (1853-1873). “Local Control vs. ‘Noblesse Oblige’: Reconciling Conflicting Mission Values in Mthatha,South Africa” - Jesse Zink, Student, Yale/Berkeley Divinity Schools, and former Young Adult Service Corps missionary of the Episcopal Church to Mthatha - Two central values in overseas mission work are local control of mission efforts on the one hand and, on the other, the use of the superior wealth, education, etc. of developed countries for the benefit of people in less developed regions of the world. This paper argues that these two values are often in conflict in mission, particularly when it comes to medical care. Drawing on the mission experience of Jenny McConnachie, an Episcopal missionary from North Carolina who runs a clinic in a shantytown outside Mthatha, South Africa, the paper cites two examples in which these values directly conflicted and identifies possible resolution in appealing to Biblical commands to build up the members of the local community. In this way, "empowerment" becomes not just a mission buzzword but a meaningful strategy for furthering God's mission of reconciliation. “The Common Cup and the Body Politic: Episcopalians, Other Protestants, and the Turn-of-the-Century Debate about Germs” - Lauren Winner, Ph.D. , Asst. Prof., Duke Divinity School, and Book Review Editor, Material Religion - In the late 19th century, new knowledge about germs prompted many clergy, especially in Methodist, Presbyterian, and Congregationalist churches, to set aside the common cup in favor of individual communion cups. This paper will explore both why ministers in other denominations adopted individual cups (including fears about immigration and the "wrong sort" of people's communing with white middle-class Christians), and why many Episcopalians resisted the change. Turn-of-the-century debates about the intersection of health and liturgical practice reflect interlocutors’ commitment to health, but they also reflect fears and anxieties about the social and political body. Reflection on these past debates may illumine the complexities of current-day efforts to implement the MDGs. “Bringing Social Christianity to Virginia: Walter Russell Bowie, 1912-1923” - Samuel C. Shepherd, Jr., Ph.D. , Professor of History, Centenary College of Louisiana - This paper examines the ministry of Walter Russell Bowie, called to historic St. Paul’s Church in Richmond in 1912. Amidst a city known for its conservatism and its heritage as the capital of the Confederacy, he brought a vision of social Christianity to Virginia. He soon inspired his own parishioners to launch a city-wide campaign for better housing conditions. For more than a decade, Bowie also championed an array of progressive reforms in his roles as chair of a new Diocese Social Service Commission and as an editor for the influential regional journal The Southern Churchman. “Church Mission in an Age of Extreme Poverty: The Episcopal Church's Engagement with the MDGs” - The Rev. Jay R. Lawlor , Rector, St. Luke's Episcopal Church, Kalamazoo, former economist, Center for International Development, Harvard University - The United Nations’ Millennium Development Goals (MDGs), seeking to reduce extreme global poverty by half by the year 2015, have provided a comprehensive framework for global engagement toward ending the most extreme forms of poverty. This paper will focus upon how the Episcopal Church’s engagement with the MDGs grew from a movement within the church to becoming a top mission priority by actions of General Conventions, and upon the shapes that this mission priority has taken at all levels of the Episcopal Church. “New Creation in a New Millennium: How Anglican Global Advocacy for the MDGs Grew Out of the Theological, Geographical, Liturgical, and Missiological Transformation of the Anglican Communion”- Alexander D. Baumgarten, Director of Government Relations for the Episcopal Church - “The claim of the Christian Church to make its voice heard in matters of politics and economics is very widely resented, even by those who are Christian in personal belief and devotional practice,” wrote William Temple, then-Archbishop of York, at the outset of his influential 1942 book Christianity and the Social Order. But by the beginning of the 21st Century, broad Anglican investment in the fight to eradicate global poverty and achieve the Millennium Development Goals (MDGs) had become a well-known hallmark of the Anglican Communion’s investment in shaping the world around it. This paper and presentation will trace the reasons for this transformation in attitude toward the Church’s social witness over the past seven decades. Exploring the theological, geographical, liturgical, and missiological transformations of the Church since the Second World War, this presentation will explore how Anglican social involvement evolved during those years to its present condition, and where it may go in the future. Walking in “Proud Shoes”: The Ongoing Significance of the Life and Writings of the Rev. Dr. Pauli Murray (1910-1985) Panel Moderator: The Rev. Dr. Brooks Graebner, Rector, St. Matthew's Church, Hillsborough, NC and Historiographer, Diocese of North Carolina. Video Screening: Charles Kuralt - "On the Road: Interview with Pauli Murray" (1977) - This year marks the centennial of the birth of Pauli Murray, a life-long champion for civil and human rights who grew up in Durham, N.C. She was the first woman to graduate from Howard Law School , she advised Eleanor Roosevelt on civil rights, and she co-founded the Fellowship of Reconciliation and the National Organization for Women. In 1977, she became the first African-American woman ordained as an Episcopal priest. Pauli Murray’s first celebration of the Eucharist took place at the Chapel of the Cross in Chapel Hill, N.C., where her enslaved grandmother worshipped as a child. Presiding Bishop Katharine Jefferts Schori preached and celebrated in the same Chapel to mark the 30th anniversary of Pauli Murray’s first celebration.